Devadne presides over the root system of the Midas Tree, where her role is to anchor the tree into the ground. She teaches the hero Joshua a meditation technique called grounding, which helps anchor his conscious awareness within the physical reality of the tree. Devadne’s helpers are shiny bronze energy devas. 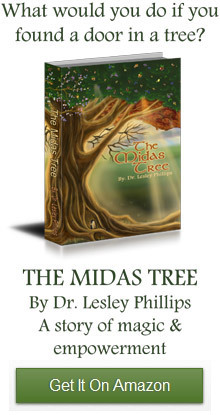 They help ground the energy of the Midas Tree using the same meditation technique. Look at the drawing on the left to see how the devas create a flow of energy from a spiral energy center near the base of the spine that then flows all the way to the center of the earth. 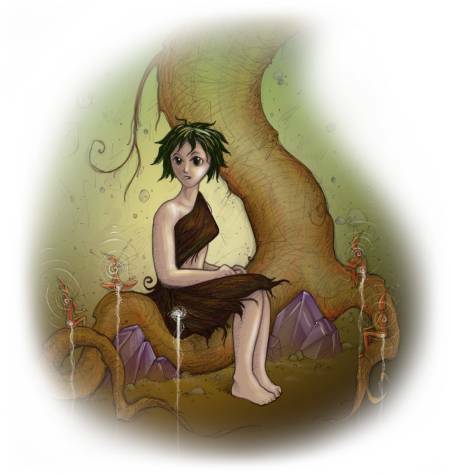 Devadne also helps the Midas Tree to release and transform stored waste products. When you ground as shown in the picture, you can use the flow of energy to release unwanted things. Devadne wears clothes made from her domain within the root system of the tree. She has a grass skirt and bikini top that are woven from the finest roots and root hairs of the tree. She is named after Evadne, who in ancient Greek mythology, was the daughter of Poseidon God of the underworld.